I have blogged several times recently about developments in the USA. The reason for devoting so much attention to the USA is probably that there is plenty of news coming out of that country, and relatively little that concerns our own. A close following of the internet produces many positive stories about the progress of the traditional Mass in America. Almost every week one hears of new locations where regular Latin Masses are being established. Even after accounting for the far greater size of the USA, when compared with England and Wales, it is evident that the "TLM" is forging ahead at a much greater pace than it is in this country. In England and Wales, there are about 50 Latin Masses on the average Sunday. In the USA, there are at least 1000 - in fact so many that it has proved too difficult for me to count them. In the USA, there are more than 30 formally recognised personal parishes for Latin Mass communities, whereas we have none. I frequently read of American bishops taking the initiative in getting Latin Masses introduced into parishes. This is rare on this side of the Atlantic. I have often said that if we want a glimpse of what things will be like here in 20 years time, it is worth looking at how things currently are in the USA. If this principle is anything like correct, we can look forward to better times. This story is so big that I am surprised that it has not had greater coverage on the blogosphere. 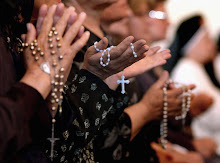 It concerns a Latin Mass community in Huntsville, Alabama. 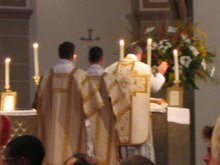 Following the motu proprio of 2007, a Latin Mass was established at the church of St Mary of the Visitation in Huntsville. With the approval of the Bishop Robert Baker of Birmingham, Alabama, the local parish priest, Fr Fr Alan Makey, started to say regular masses in the usus antiquior in the existing parish church. It became so popular that the congregation began to look around for a church of their own. They have been raising money, and in 2013 had raised enough money to purchase a former Anglican church. This has now been dedicated to Our Lady Help of Christians by Bishop Baker and serves as a personal parish for the traditional community. Fr Makey has been appointed as pastor and there are two Masses every Sunday, as well as daily Masses and other devotions. There are more than thirty traditional parishes in the States, but this is the first example that I have come across, here a church has actually been purchased specially for the purpose. Mississippi is the only State in the USA that currently does not have regular Masses in the usus antiquor. This is about to be corrected. The newly appointed bishop of Jackson, Rt Rev Joseph Kopacz, has asked the Canons Regular of St John Cantius to hold a workshop to train priests and servers in the older form of the Mass. The Diocese has announced that this will take place from 2nd to 5th September at the Cathedral of the Diocese of Jackson. Bishop Kopacz is to be congratulated on this initiative. It is yet one more example of how much further matters have advanced in the USA, compared with most European countries. I have just read that the first Mass to be offered at the church of St Walburge in Preston under the auspices of the Institute of Christ the King Sovereign Priest will be at noon on Saturday 27th September. 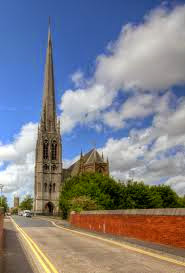 If you do not know the church, it is the church with the tallest spire in England. It's architect, Joseph Aloysius Hansom, was born in York - and you cannot get a better recommendation than that! I would like to get a party together from the Middlesbrough Diocese to attend this Mass. If you are interested, leave a comment. On Friday 15th August at 6pm,there will be a sung Mass of the Assumption at the Church if St Wilfrid in York. The Feast of the Assumption is, of course a Holyday of Obligation. 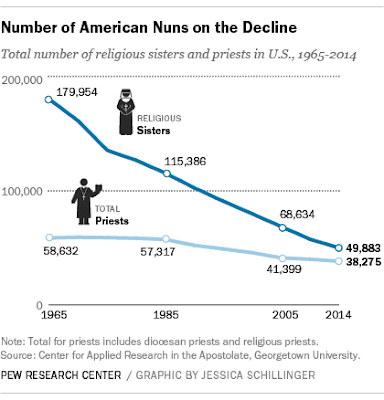 The following graph, tracking the numbers of nuns and priests in the USA has recently been published. Covering the period from 1965 to the present, it shows that the number of nuns has declined by 72%, whereas the number of priests has declined by 35%. The population of the US has increased significantly during this period, as has the Catholic population. The most striking aspect is the difference between the rates of decline for nuns and for priests. In England and Wales, the trends are broadly similar, although the decline in the number of nuns has not been quite so fast. It is very pleasing to report that the Oratory in Formation in York has attracted its first novice. Although the Oratorian Fathers have been at York for less than a year, several young men have enquired about joining the community, and have stayed for periods to experience community life. There is an expression: Don't count your chickens until they have hatched. It is wise to be cautious in assessing prospective vocations. However we do have some real progress to report. Adam Fairbairn was clothed in the Oratorian habit about a week ago and is now starting his noviciate. He will spend most of the next six years studying in Oxford, although we should see him from time to time in York. We wish him well in his new adventure. The Solemn Requiem Mass of rememberence for those who died in the Great War and subsequent conflicts, which took place at St Wilfrid's Church in York last night, was well attended. Fr Richard Duffield was the celebrant and preached on the subject of forgiveness. 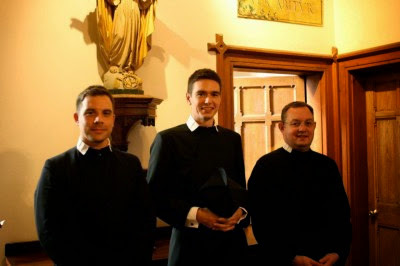 Fr Nicholas Edmunds-Smith was the deacon with Br Adam Fairbairn as sub-deacon. Fr David Smith, Army Chaplain, was in choir as was Fr William Charlton. Fr Smith brought with him a number of young soldiers from the Army College in Harrogate.# At the end of Mass, a bugler from a police band played the Last Post. He is also in the photograph. 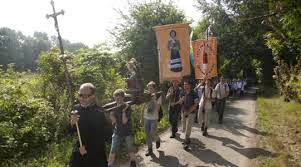 The Latin Mass Society's walking pilgrimage to Walsingham is not much more than two weeks away, but there is still time to book in. It takes place from 21st to 24th August, which is over the Bank Holiday weekend, and involves walking the 55 miles from Ely to Walsingham. This is what it looks like. For full details and information on how to book, go the the LMS website, and look under pilgrimages.